The limes make this fresh and flavorful, the sugar is in perfect balance with the limes, and the sweetened condensed milk adds a delicious creamy taste. 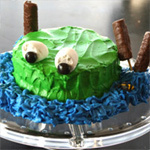 This is another recipe by Janet Athay that you will love! 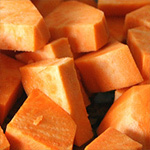 Place them in a blender along with the sugar and 2 c water. Pulse the blender up to 4 times. 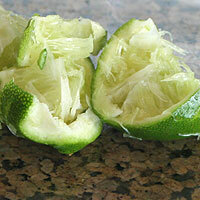 The limes should be mostly intact after they are processed. Pour 4 more cups or water over the limes. 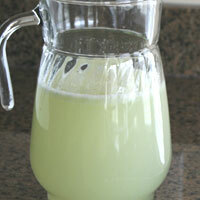 This cleans any extra sugar left behind on the limes. Lift the colander and discard the limes. 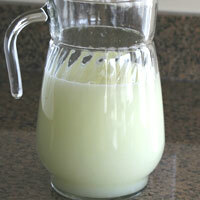 Pour the mixture into a pitcher. Add the sweetened condensed milk. Add up to 2 more cups of water depending on your preference of strength. I like to add 2 cups of ice and no extra water. Stir until the sugar is completely dissolved. Serve immediately for best taste or up to two hours later. 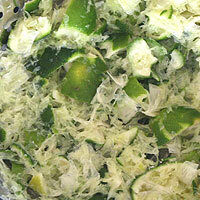 The biggest problem in making this is over-processing the limes. It will make the limeade very bitter and it will not taste fresh. It will seem like you are under-processing the limes, but you will get plenty of taste from very little processing because the lime rind adds a lot of flavor. Lemons are great in the recipe as well. 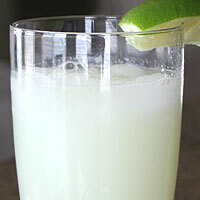 A mixture of lemons and limes is also good. Adding fresh raspberries or fresh sliced strawberries at the end is a great twist on the flavor. 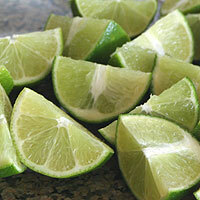 Fresh sliced lemons and limes also add great taste and make it look delicious. Quarter four limes. 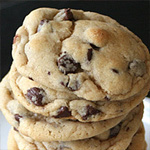 Place them in a blender along with the sugar and 2 c water. Pulse the blender for one second up to 4 times. The limes should be mostly intact after they are processed. 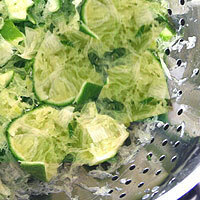 Place a colander in a large bowl and pour the mixture into the colander. Pour 4 more cups or water over the limes. This cleans any extra sugar left behind on the limes. Lift the colander and discard the limes. Pour the mixture into a pitcher. Add the sweetened condensed milk. Add up to 2 more cups of water depending on your preference of strength. I like to add 2 cups of ice and no extra water. 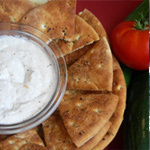 Serve immediately for best taste or up to two hours after it’s made. 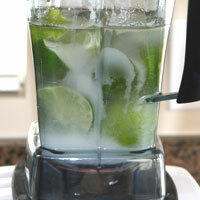 The biggest problem in making this is over-processing the limes. It will make the limeade very bitter and it will not taste fresh. It will seem like you are under-processing the limes, but you will get plenty of taste because the lime rind adds a lot of flavor.